This course establishes key educational competencies and new standards for evidence-based biomechanical analysis in yoga prescription. Both prevention and pathophysiological approaches are addressed in order for clinicians to enhance their current clinical services, as well as understand how to diversify or expand their practice into community and public health settings. This course reviews the science that allows yoga to be prescribed as medicine including neurovascular, neuromuscular, musculoskeletal, and myofascial intervention. Using medical therapeutic yoga allows the clinician to improve patient outcomes by affecting the underlying biochemical status of the individual that ultimately dictates physical health. Explain the joint stabilization requisites used in Medical Therapeutic Yoga (MTY) which allows yoga postures to be evolved for use in clinical prescription. List the evidence-based precepts for achieving lumbopelvic health. Differentiate between yoga postures categories that facilitate safe modification and allow for medical adaptation in both high- and low-functioning patient populations. Apply the latest research in lumbopelvic neurophysiology to allow yoga to be prescribed in rehabilitation. Describe the Functional Movement Assessment (FMA) algorithm for assessment and prescription and how it impacts functional progression for objective goal setting. Explain the neurophysiology of safe yoga practice as it relates to myofascial integrity and neural mobilization. List the guidelines, precautions, and contraindications for performing soft tissue mobilization and/or manual therapy in yoga poses. Identify how myofascial and neural impairment can be addressed through MTY. 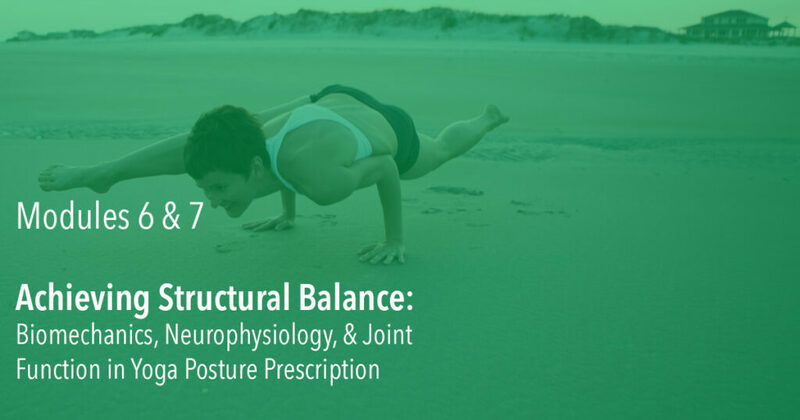 Understand kinematics in posture progression and prescription for affecting functional neural patterning and balance across the lifespan.